Summer is here since few weeks now and I hope that you are enjoying it fully! For me, these months have always been time to make some homemade jams thanks to the excess of fruit from the garden of my parents. This time although, I am bringing you a recipe which does not have any garden fruit (unless you live somewhere in the South). 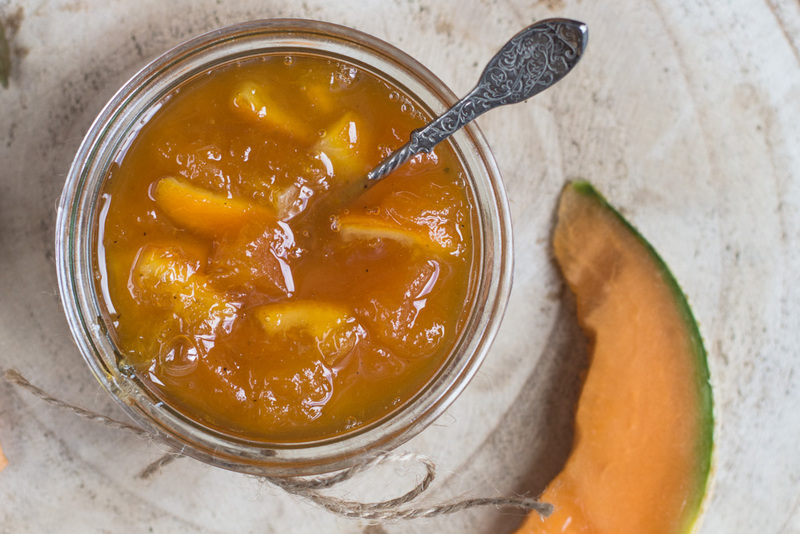 Nevertheless, this gourmet Melon, Orange and Cardamom Jam is delicious! It contains whole chunks of the melon Charentais and non-treated orange with zest, and a touch of Cardamom, which just tastes heavenly all together and the flavor is surprising. For this recipe, I got inspired by Christine Ferber, the French jam guru. Last year I bought her book devoted to the homemade jams and love it so far! There are so many tempting recipes that I never know which one to try first. When I recently got two Charentais melons on the market, the choice was clear. I made the Melon and Orange Jam and added some Cardamom, which turned out great that even my dad and my sister made this jam disappear very quickly. 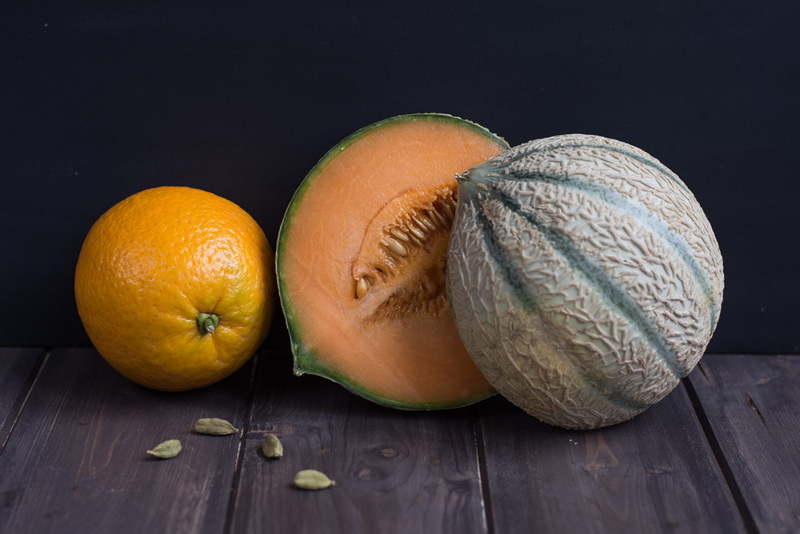 Melon Charentais is a small variety of sweet orange-fleshed melon. 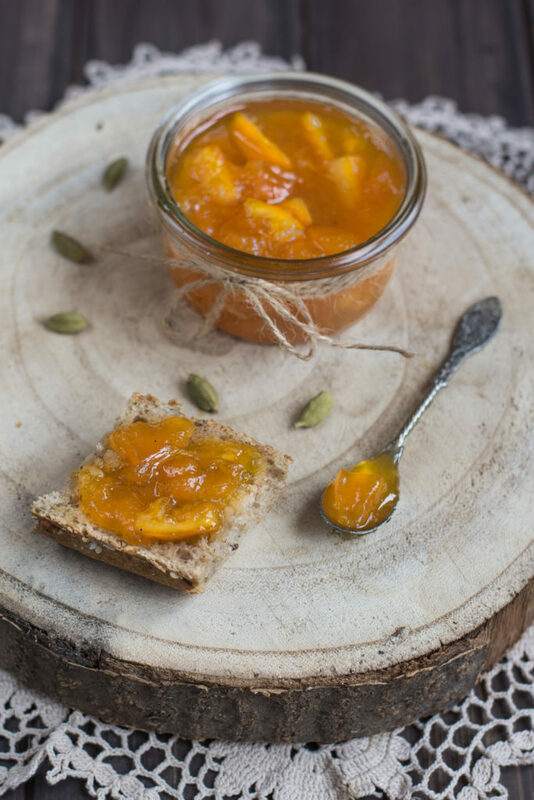 You will also need non-treated or bio oranges as they will be used entirely with the zest in this Melon, Orange and Cardamom Jam. Make sure that you have the thermometer for sugar. The preparation of the jam is not difficult, but be aware that you need additional 12 hours for the maceration (I leave it overnight). Easily prepared apple juice needs to be added into this jam as the melon does not contain much pectin. 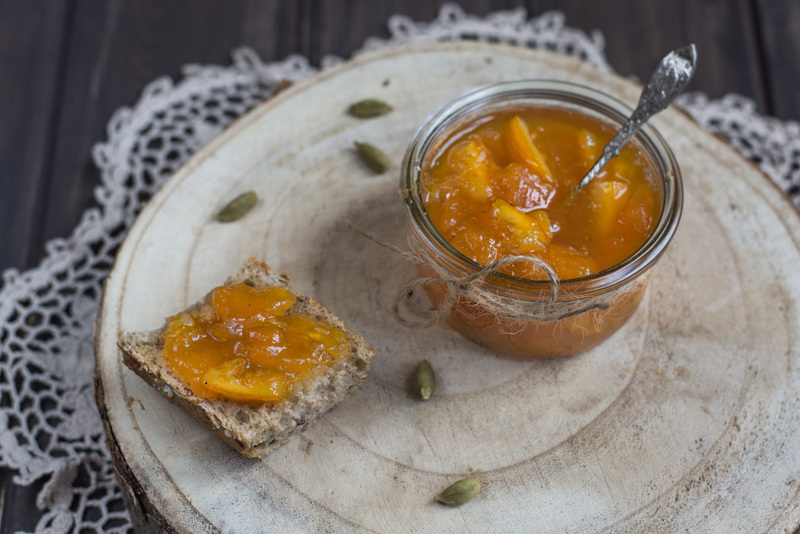 Here is the recipe and if you make this Melon, Orange and Cardamom Jam, please do let me know how it turned out in the below comments. I want to hear from you! 🙂 And if you like gourmet jams, try also the Apricot Vanilla and Almond Jam! 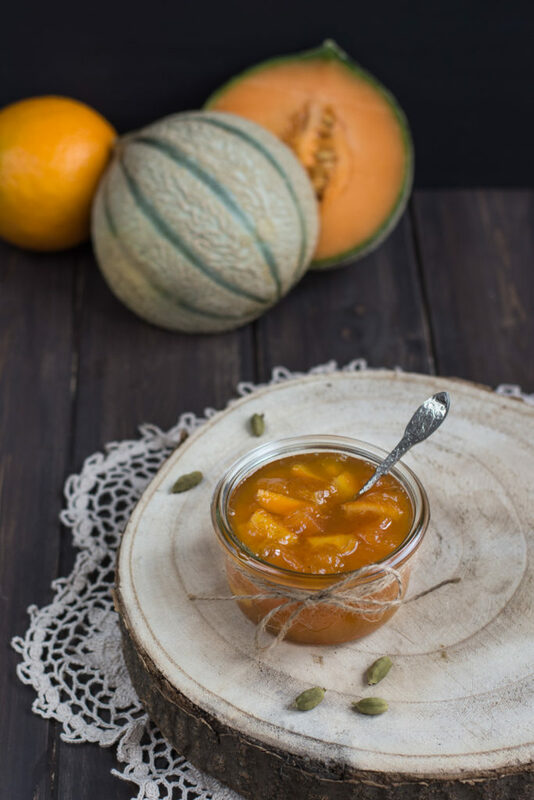 This gourmet Melon, Orange and Cardamom Jam contains cubes of melon and non-treated orange with zest, and a final touch of Cardamom. It tastes heavenly! Halve the melons, remove the seeds and peel the skin. Then chop the flesh into small cubes (you should have about 800 g). Clean the oranges under cold water using a brush, dry them and cut into slices. Then cut each slice into eighths. In a large bowl, mix the melon with orange, sprinkle with crystal sugar and add the lemon juice. Cover with aluminum foil and leave to stand for 12 hours (overnight). Preheat the oven to 100°C in order to preheat the clean jars in the oven. Pour a boiling water over the lids and dry them with a clean towel. Place a colander over a large saucepan and strain the sugary liquid off the fruit into the saucepan. Remove the colander with fruit and set aside. Bring the syrup in the saucepan to boil and cook until the temperature reaches 110°C (or when the rolling bubbles have calmed down and remind tiny pearls). Add the fruit chunks and apple juice*, bring to boil again and cook for 10 minutes or until the jam thickens. Check if the jam is done: remove it from the heat, pour a little amount of it onto a cold plate and place it in the fridge for a couple of minutes. You will see that the jam is ready when it wrinkles once touched. Once the jam is done, carefully fill the preheated jars, close them well and turn bottom up for 10 minutes and then store on a cool place. *The apple juice needs to be added to this jam as the melon does not contain much pectin. You can prepare it very easily: wash 400 g of sour apples (Granny Smith or Idared) and cut into fourths. Place into a large saucepan and cover with 600 ml of water. Bring to boil and cook without stirring for 30 minutes. Strain the apples, reserve the liquid and use the apples to make a compote. You should have the needed amount of juice - about 150 ml.